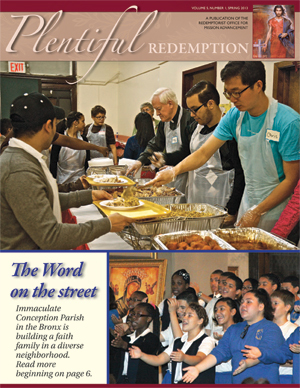 In this edition, read about our ministry at Immaculate Conception Parish in the Bronx, situated in the poorest congressional district in the country. Also, as part of our Year of Faith celebration, Fr. John McGowan offers us his reflection on what it was like to begin his priesthood at the start of the Second Vatican Council. Click here to download the Spring 2013 Plentiful Redemption. Find out how you can become a Friend in Mission. And read about how one couple’s life has been enriched by their work alongside the Redemptorists.